As of this week, I am officially a Master’s student. 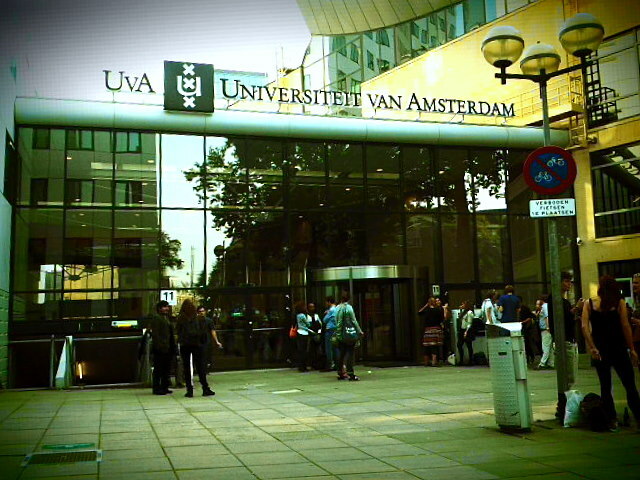 After a semester of “prep,” the University of Amsterdam has deemed me qualified to work toward a Master’s in Sociology. Never mind the fact that the somewhat disorganized University hasn’t provided me with a new id card and my residency permit is currently in limbo (let’s all pray to the spirits that I don’t get kicked out of the country before someone figures out how to process paperwork). Last semester felt like a valuable warm-up. Sort of like a Taebo work-out after not lifting more than a glass of wine for the past eight years. And now I’m getting ready for capoeira (something that I’ve always wanted to do – both in and out of metaphor). Now I have three classes: one on social theory, another on qualitative research methodology (beginning with ethnography), and finally migration and integration (my concentration). Anyone have any well-written, academic papers I can buy? I kid, of course. I’m almost positive I can handle this. I’m not as nervous. My apartment is furnished. Dutch no longer sounds like complete gibberish (except when I try to speak it). I’ve met some great new people. And I know the differences between Weber and Durkheim. If that doesn’t make me a future master of something, I don’t know what will. But this is it. I basically have nine more months before real life picks up again. So while I’m studying this semester, and preparing to write my thesis next semester, I will be thinking and planning for the future. A source of income, a place to live, and a way to turn the ideas in my head into something real. After this, I’m not sure how many do-overs I’ll be granted. So I need to make this time count. And if you’re wondering, returning to the States (to live) is nowhere in the plan. Good to read all’s going relatively well, by the way I have seen the first pics of Zwarte Piet on products in the shops again. Could he bring you a 125 years old St. Nicholas gift, a Dutch edition of Uncle Tom’s Cabin, or don’t you like that kind of books? You’re on it already. The light skinned guy is dead and the horse cannot keep accounts. Problem is, the new paper with traditional racial charicatures is not in stock yet and Piet could not find your address. Would sending it to Ninsee with for Dana from the USA work? Lol. I’ll send an email. OK, poem in Dutch or English? Dana, you are so inspiring me. I wanna leave too! Thanks for sharing, you rock. Thanks Krystal!! You’ve always been a smarty pants inspiration. And if you want encouragement to leave the US, you’ve come to the right person. Exodus!! I miss you! Whaddya mean you’re not coming back?